kilala.nl - Intensive kendo training: "central training"
Intensive kendo training: "central training"
Almost a year ago I visited the Landstede sport center in Zwolle, to participate in the NK kyu-graded kendo. Today, we made the trek to attend the first 'central training' of the year. 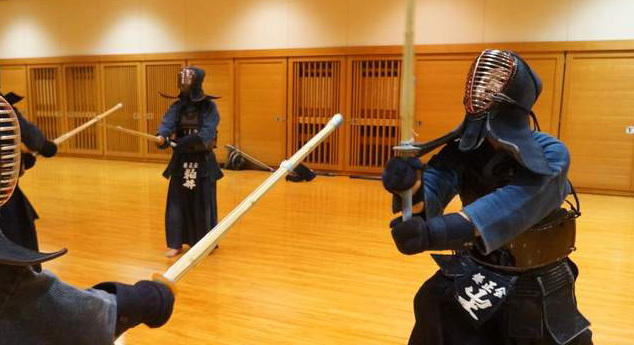 It's "central" insofar that it's a large kendo training, for all dojo in the Netherlands. Marli took Dana for a fun-filled morning at Ballorig in Hattem, while Jeroen-sempai, Nienke and myself went to the training. Marli 'sacrificed' her usual day off, so I could have a great training day. 25 minutes of joint kihon practice of hayai-techniques. Also, ki-ken-tai-ichi exercises. 80 minutes of waza practice under Vitalis-sensei, while Wouters-sempai instructed the beginners. Under Vitalis-sensei, the group was split into mudansha and kodansha so everyone got from practice what they needed. We practiced the following techniques, some of which were new for many of us. Each technique was practiced 2x2 times, after which shugou was called in order to learn the next one. Normal hiki-dou. A dou strike cannot be valid, as long as the opponent has not opened up; if the kamae is maintained, you can strike all you like without scoring. In this practice, motodachi would "help" by reacting to pressure, by lifting upwards a little bit. A variant hiki-dou, using surprise. From tsubazeriai, smack your opponent's left temple while putting your right foot more to the right (for leverage), which will cause a surprised reaction where he pushes his shinai towards his left/your right. Now the center has opened, so you can perform a hiki-dou. A short-range hiki-kote. Starting from tsubazeriai, while maintaining pressure, put your left foot backwards a bit. Bring yourshinai to your shoulder while kicking off, then strike kote where your tsuka goes to your left hip. Show zanshin while moving further backwards, by bringing your shinai back to your center, pointing upwards. Men, kaeshi-dou. This technique will simply not work if you're not efficient enough in your movements. Swing up when motodachi is very near to striking your men, then strike dou using the same movement. Men, suriage-men. Same as the above, you need to be fast and efficient. A backwards men, suriage-men. Sometimes, your opponent will simply be too fast for you. It is then a very valid tactic, to back away from him. You can block his men using suriage, then perform a men strike with zanshin in the normal position (not hiki). Unlike a forward moving suriage-men, the backwards version requires a short pause between the deflection and the return men-strike. You want everyone to know that the strike is valid and not a panicked reaction. Tsuki, suriage-men. You deflect motodachi's tsuki with a very simple movement: you push your shinai downward straight through the center ever so slightly, over the top of his shinai. This will make the tsuki go wide, leaving you to strike hayai-men. Nuki dou, where you strike dou even before motodachi can hit you. Obviously this means you need to be damn quick ;) No big movements! You do hayai-dou, where your shinai only goes to your shoulder, then you immediately strike! A special nuki dou, which Vitalis-sensei was taught 30 years ago by his teacher in Japan. It had many people baffled! You perform nuki-dou, then quickly raise your shinai straight up, stepping backwards with your right foot while turning in-place while your opponent passes you. Turn to face him and resume kamae. A special nuki dou, where you sink your whole body downwards right before the men strike connects. During this movement your shinai moves to the right. Move backwards to the left, while you strike the left side of opponent's dou (which is not the side you usually strike). Katate han-men. Another surprising technique where you quickly make a long-range attack. From kamae swing upwards, then step forward with your -left- foot and do a single handed strike to motodachi's right temple. Move forward with reverse suriashi, or step through with right and use normal suriashi. I got a chance to have jigeiko with three of the leading sensei. I didn't receive any specific feedback from Barbier-sensei. I tried to use a few of the techniques we learned, combined with some of the stuff Heeren-sensei taught us. After a few minutes, Barbier-sensei asked me to do a round of kirikaeshi. I very much enjoyed my round with Castelli-sensei, who has a very enthousiastic and energizing personality. She let me try a few techniques, then took me aside to tell me (paraphrased): "You need to want your target. I see you hitting air, making a lot of movement, but never getting to where you want to go. I see you go for men, but you don't get to my men. I see you go for kote, then don't hit kote. You need to WANT to hit. You need to WANT to put your shinai on my head! Be hungry! You need to be like an animal of prey". And yeah, that was a very interesting realization for me! I hadn't thought of it like that, but she's right! The next few attacks I was a lot more focused, after which she took me aside again. "The Japanese say: ichi gan, the eyes are first. I see you very often not looking at your target. You strike my kote, but look somewhere completely else! Don't! Eyes on the target!". Right before the closing kirikaeshi, I had a very short round with Vitalis-sensei. At first I had offered to cede my position to mrs De Jong who outranks me, but Vitalis-sensei said I shouldn't do that. "I don't care if they're 10th dan! In kendo you need to be hungry and egotistical to get the training you want. You need to be fast in dressing, first in line and scramble for practice with the teachers you want!" Based on the few strikes I made for him, he also warned me that right now I shouldn't yet be trying "patient"/"waiting" kendo. "Make attacks! Make plenty of attacks! Right now you still have plenty of time to make plenty of mistakes. If two out of ten strikes land relatively close, that's great!" Which certainly sounds a lot like what Kris-fukushou keeps telling me: I wait too much. During closing, Vitalis-sensei shared the following remarks. Beginners should really make sure to stretch their left arms properly. Don't hook them! Upon striking men, your right thumb should be pointing to motodachi's face and your left thumb should point at their tare. Similarly, beginners should also often repeat the ki-ken-tai-ichi exercises: your right hand and your right knee are "connected" by a rope, both go up and down at the same time. Those in bogu should work on efficient movements. Very often it is enough to work from your elbows or even your wrists! Shoulder movements are large and thus slow. He also mentioned that 95% of us did not pass our opponents at maximum speed. Almost nobody actually speeds -up- after making the strike, which you really should be doing! Those in bogu should stabilize their heads! Very often, heads would wobble backwards (like in this photograph) when going for a strike. Instead, imagine a stick being tied behind your head, back and hips: your whole spinal column should remain straight when moving.